ATLANTA, Dec. 22, 2017 /PRNewswire/ -- Aaron's, Inc. (NYSE: AAN), a leading omnichannel provider of lease-purchase solutions, and its divisions Aaron's and Progressive Leasing, this week surprised single mom, first-time homeowner and Atlanta resident Catherine Echols and her children with rooms of furniture to fill their new home as part of the Homes for the Holidays (HFTH) program sponsored by former NFL star Warrick Dunn. Aaron's, Inc., a leading omnichannel provider of lease-purchase solutions, and its divisions Aaron's and Progressive Leasing, surprised single mom, first-time homeowner and Atlanta resident Catherine Echols and her children with rooms of furniture this week to fill their new home as part of the Homes for the Holidays (HFTH) program sponsored by former NFL star Warrick Dunn. As part of the Homes for the Holidays (HFTH) program sponsored by former NFL star Warrick Dunn, Aaron's, Inc., a leading omnichannel provider of lease-purchase solutions, and its divisions Aaron's and Progressive Leasing, surprised single mom, first-time homeowner and Atlanta resident Catherine Echols and her children with rooms of furniture this week to fill their new home. 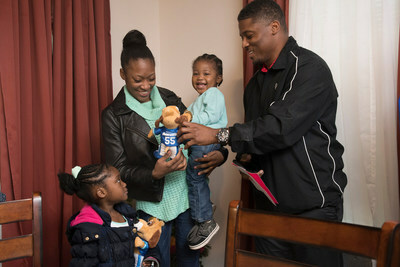 Echols' home was the 159th presentation by Warrick Dunn Charities' (WDC) Homes for the Holidays program, which assists single parents in becoming first-time homeowners. In partnership with Aaron's and Habitat for Humanity affiliates, WDC provides the materials necessary for long-term stability and the provisions required to make a meaningful impact on the parents and their families. 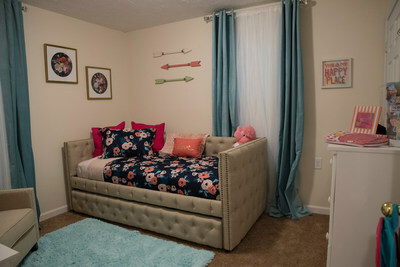 "Aaron's is thrilled to be working alongside Warrick Dunn and Habitat for Humanity to provide the Echols family with the holiday surprise they so deserve," said John Robinson, CEO of Aaron's, Inc. "Catherine Echols works hard to provide for her children, and it's so gratifying to be able to give her and her family beautiful home furnishings to help make their home truly their own." Catherine Echols works at Hartsfield–Jackson Atlanta International Airport where she recently earned a promotion for her hard work. She supports her two young children ages 4 and 1 year old. She is the youngest member of her family and the first to achieve the dream of homeownership. "The past 20 years have given me invaluable insight into the importance of making affordable housing available to all," said Dunn. "I will continue to live out my mother's legacy by helping parents and their dependents reach stability. I am grateful for the numerous sponsors, board members and donors who have worked alongside me for the past two decades. Together, we are changing the game of affordable housing." To date, WDC and its sponsors have rewarded 159 single parents and over 420 children and dependents with first-time homeownership in 15 cities across the nation. Warrick Dunn Charities, Inc. provides hope and healing to communities through innovative programming inspired by our founder's life journey. Since 1997, the Homes for the Holidays program has helped over 159 single-parents and 420 children and dependents achieve first-time home ownership. Serving single-parent families nationwide, WDC and its partners have helped single parents to combat poverty and hunger and ensure families have basic necessities and comfortable surroundings in order to improve their quality of life. For more information, visit www.wdc.org. Atlanta Habitat for Humanity transforms communities through neighborhood revitalization, education, innovative development and partnerships. As one of the largest affiliates of Habitat for Humanity International, Atlanta Habitat has built more than 1,500 houses—impacting the lives of more than 5,500 family members and 100 neighborhoods—since 1983. In addition to constructing quality, affordable, energy-efficient homes, the nonprofit homebuilder also rehabs existing structures and performs minor repairs for qualifying homeowners. Houses are sold with zero-interest mortgages to first-time homebuyers in Atlanta and South Fulton County. Visit www.atlantahabitat.org or follow us @atlantahabitat on Twitter.